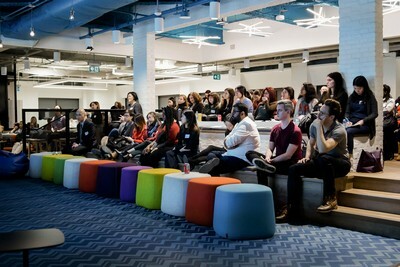 On January 16th, our Toronto chapter launched its first meetup of the year, gathering over 100 members to join the panel discussion on Data Trends of 2019. We were thrilled to have Nicole Brouillard (Chief Information Officer at Aviva), Katrin Shechtman (Head of Architecture at Thomson Reuters), Jan Kestle (President of Environics Analytics) and Janice Tsang (Senior Analyst at RBC Ventures) share their insights on the panel, moderated by Lilian Lau (Data Scientist at Aviva). Over the past few years, the landscape of big data has been transformed. Predictive analytics continue to penetrate more industries, while the rise of tools that automate data analysis and machine learning — with no less than a simple drag and drop — has improved accessibility for those who would like to glean insights. Moving into 2019, we expect some of these topics to stay in the spotlight and some of them to fizzle out in the background, giving room for new trends to rise. The panel believes that ethics surrounding data and the role of human judgement in machine learning will stay in the spotlight for 2019. Nicole gave an example of how age plays an important factor when it comes to pricing an insurance policy, but warned that, if an organization acts blindly on their model outputs, a customer may have her premium doubled, unfairly penalizing her for simply turning the age of 80. To reduce the unintended consequences of acting on model outputs, the panel urged us to clearly define and align the organization’s goals during the design and evaluation of models. The panel also highlighted a continued common theme: the problem of siloed data, where different data sources become irreconcilable to teams working too independently from each other. Katrin acknowledged that data-driven models can take a tremendous amount of time to move from development to production. 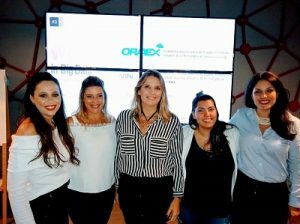 She challenged the audience to pull all key stakeholders into one room and open up communication channels between their business folks, engineers, developers and, of course, data scientists. Unlike big corporations, small- and medium-sized businesses have fewer resources to purchase data sets or hire a dedicated team to work with data. Jan urged such companies to be creative when it comes to data collection and analysis. For example, the addresses filled out by customers reveal the geographical concentration of their clients and how far people are willing to travel for their business. Janice suggested small businesses should first define their business goal, then explore what data they will need to meet their intentions. This can avoid situations where a team spends a huge amount of time collecting data, then realizes that it is not enough, or that they already had what they needed in the beginning. A shout-out to our organizers, Alyssa Ong, Lynn Yen, Emma Jones, Renita Sudirga, and Lilian Lau for making this event a huge success! This event was generously sponsored by Aviva and Quandl for the space, food and beverages. 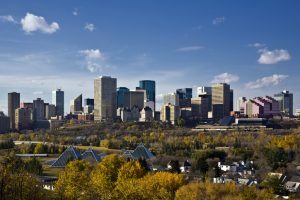 Aviva is a multinational company and a leading insurance provider in Canada. Their dedicated innovation team works with disruptive startups to bring new technologies to Aviva and their customers. Quandl, recently acquired by Nasdaq, is a data marketplace for the world’s top hedge funds, asset managers and investment banks. 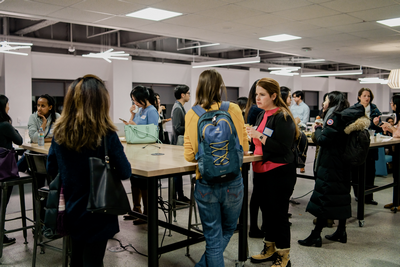 The Toronto chapter of WiBD is currently organizing our next meetup, where we will again strive to connect like-minded data professionals in an inviting environment. If you are interested in participating, speaking or sponsoring us, please contact us at wibd.toronto@gmail.com! Women in Big Data So Cal Campus-Driven Model: Tips for Starting Your Own Chapter!